Outside, an employee polishes a Wendy’s sign until it sparkles. Inside, customers entering the spotless restaurant are greeted with a chorus of “Irasshaymase!” (Welcome!) from a team of well-groomed, smiling young managers and crew people. The service is fast and friendly, the food is excellent and the kitchen is as clean as the dining room. No wonder, then, that Japan is Wendy’s largest and most successful foreign market outside North America. 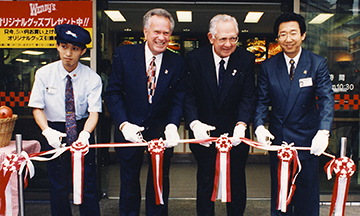 The Japanese franchisee opened its first store in 1980, and by January 1, 1996 was operating more than 50 units. 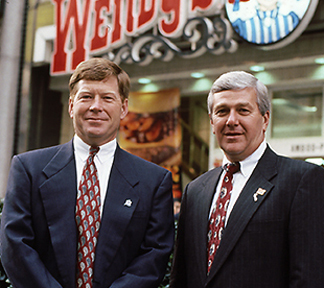 John Wright, left, and Tom Morrell in front of the Wendy’s on the popular Ginza. Japan also has some of the highest sales averages in the system. The Ikebukuro store averages $94,600 per week. That’s more than $4.5 million a year from a single restaurant. Several others are in the $50,000 to $65,000 per-week range. 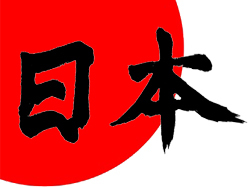 The Japanese market is operated by Wenco Japan, a subsidiary of The Daiei, Inc., one of the world’s largest retailers. There are several secrets to their success, according to Morrell. 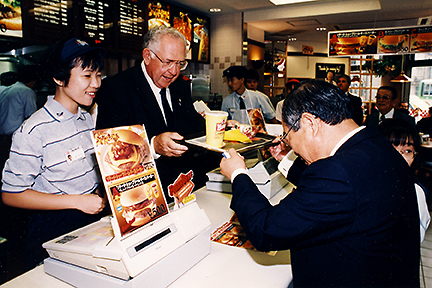 Wenco has a strong team of senior managers dedicated to reproducing the Wendy’s concept in Japan. They make regular trips to the United States and other successful Wendy’s markets to ensure their operation takes advantage of the latest thinking in quick-service. As a result, their restaurants feature updated décor packages and they’re making their menu as consistent as possible with U.S. offerings – while still appealing to their Japanese customers. Wenco’s managers average eight years tenure with Wenco Japan. The company draws new manager trainees from college graduating classes every April, from internal promotions and from other parts of the Daiei retail organization. Unlike Wendy’s in the U.S., where many part-time crew people are high schoolers, in Japan, only college-aged crew people are hired. “We feel these people are more mature and more self-disciplined,” said Takashi Tsujioka, Wenco’s acting senior vice president for operations. While the operation is one of the best, the Japanese market is not without its challenges, primarily high real estate and food costs, intense competition, and a flat economy that has reduced consumers’ disposable income. Competition is intense in Japan. According to Taniguchi, “We don’t compete just with the traditional chains. Now we also have to compete with bento (pre-made lunchbox meal) carry-outs, delicatessens, convenience stores and supermarkets. These are all potential competitors. 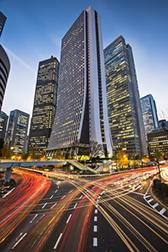 While the Japanese economy has been in a slump for the past several years, it is still one of the world’s largest economies, with very high per capita income. There are millions of potential customers. The Tokyo/Yokohama megalopolis is one of the largest urban population centers in the world, with almost 28 million people. This high concentration means incredible business opportunity for a quick service restaurant operation. 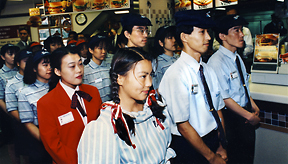 We, the employees of the Hamamatsu-cho Wendy’s, pledge before Senior Chairman Dave Thomas and our president, Mr. Taniguchi, that we will put all our effort into providing the highest quality, made to order, juicy hamburgers and other incomparable food, served faster than anybody, ensuring our number one position in the Hamamatsu-cho area. – Seki Masayuki, Hamamatsu-cho Wendy’s Manager. This Wendy’s Magazine article was part of a special edition in which the CEO laid out the company’s strategic plans for the year ahead, including those for international markets. I coordinated communication and PR for this executive management trip to Japan, and directed an AP photographer and Reuters video crew. The event got extensive news coverage across the U.S. and Japan, as well as in many large international markets. We also used the video and photos for our internal communications. This project sample is presented to demonstrate writing, strategic planning or other communication skills, and is not an official publication of the client company. The sample relates facts and activities at the time the project was done, not current client activities. Use of the client company’s name and logo is for identification purposes only, and does not constitute an endorsement by the client – either expressed or implied – of Bart Butler, Bart Butler Communications or this sample.